While a lot of folks are watching exciting races around the country, there's a referendum battle going on in Maine to watch. 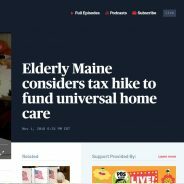 Maine could be the first state in the country to give seniors and Mainers with disabilities the freedom to live at home with dignity and independence. Read how they're doing it. If you missed it: Kaleb, a CCI member and ISU student, attended an event where Congressman Steve King took questions. 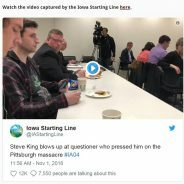 He quoted Steve King’s words and tried to ask King a question. The Congressman exploded. He had Kaleb removed from the room. Key to the story is the question Kaleb asked. 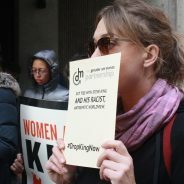 Seventy-five Iowans delivered a letter to Jay Byers, CEO of the Greater Des Moines Partnership, demanding he to cancel their event with Congressman Steve King. Days before the Nov. 6 election, this was far from a political protest. A clear moral call drew families from Des Moines and Iowa’s fourth congressional district which King represents. The speak out called attention to the fact that the Tree of Life shooter and Congressman Steve King share the same worldview. Who’s on the ballot in Iowa? Early voting began this week. You may have already received your absentee ballot. But do you know who is on your ballot? There’s more than the race for Governor. Or US Representative. Or state Representative. This election, make sure you’re prepared by checking out our BallotReady site to find out all the races you’re voting on and assemble your ballot for election day! We’ve partnered with BallotReady to help you make an informed decision when you vote. You’ll find all the races you’re voting on, as well as stances candidates have taken on key issues, as well as major endorsements they’ve received.